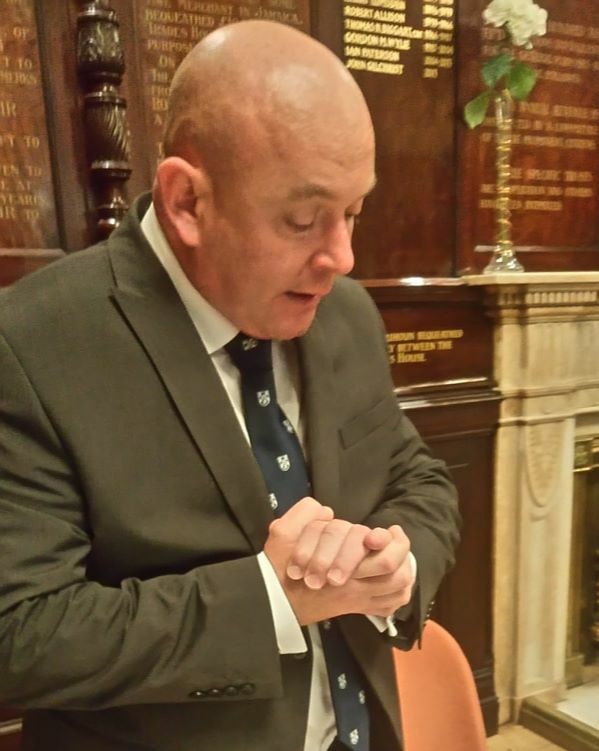 The Masons' Pear Eating is the final social event in the Trades House Calendar as the Deacon demits post the next day and the new Deacon takes up his or her post. This year's Pear Eating was a resounding success and that says a lot for the Merry Masons Pear Eating is always a great event to attend. With over 40 people attending, everyone knew we were in for a good night. 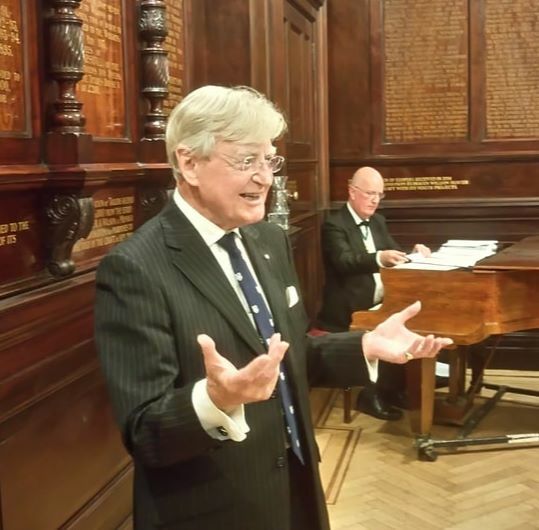 Unlike most events, the Merry Masons supply the entertainment for the evening from within their ranks and guests. A few favourites and some novel acts filled the evening with song and fun. 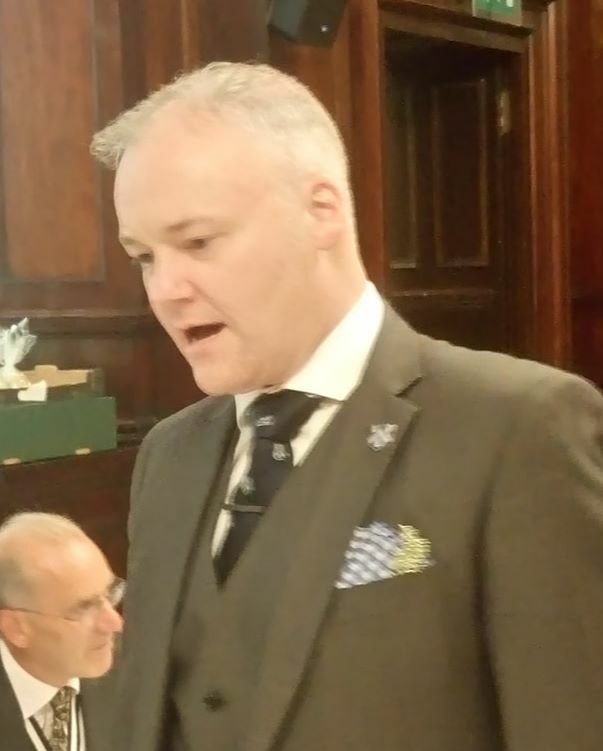 The evening commenced with a short meeting of all Incorporation members present where the Crafts' Accounts were approved, thereafter everyone moved to the Saloon for our rustic fare and entertainment. 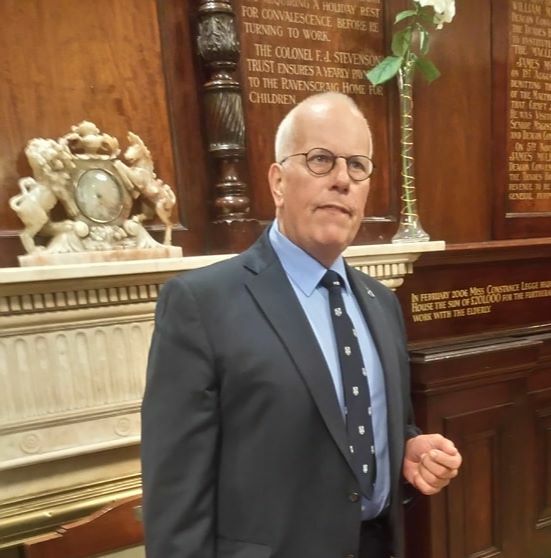 The Collector-to-be was given the roll of saying grace and this was superbly done by David Taylor who is a retired Minister of the United Reformed Church. The Trades Hall is famous for its fine dining but tonight was to be somewhat different as the Merry Masons prefer rustic fare for their Pear Eating evening. Sausage rolls, and sandwiches made up the main food for the evening and a lovely ripe, juicy pear or two made it just perfect. The Besir's cake was used as a dessert. It is worth noting the strange custom of the Besir and his cake. The Besir is the Deacon to "Be Sir", ie., the person who will take up the mantle of being Deacon of the Masons at the Choosing meeting the next day. The Besir is a position which only lasts one day and it is therefore an important and honourable position to hold. Ian A Macpherson when he was the Besir in 1989 started the custom of having a Besir cake which in those days may have been much smaller and was taken to the Steps Bar for consumption after the meal at the Besir's Party. 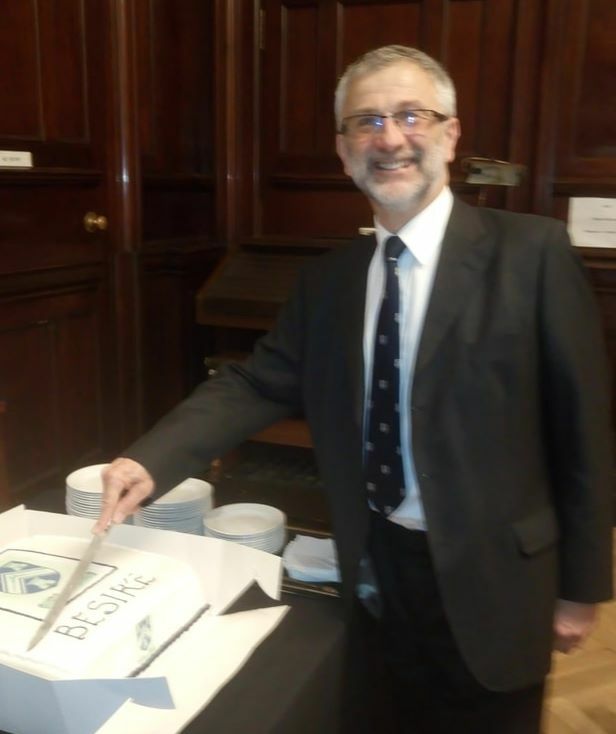 David Dobson in his year as Besir (2003) introduced having the crest of the Merry Masons on the cake and this has become normal since then. Customs soon turn into traditions, but traditions don't stand still and Deacon Craig R Bryce in his year as Besir (2013) introduced using the cake as the dessert at the Pear Eating prior to taking the remainder to the Steps Bar and now Deacon Gordon Weetch has improved it further by presenting everyone at his Choosing Dinner with a small piece of Besir cake at the end of the meal at his Choosing Dinner. After the delicious rustic meal, the entertainment commenced with Deacon David McLaren toasting the Besir and praising him for all he had done as Collector and standing in to support the Incorporation when the Collector was unable to carry out her duties due to ill health. We are fortunate in having such a steady, reliable and hard working person who would become Deacon the following day. Besir Gordon Weetch replied in his usual modest way to the glowing praises of his Deacon. After Gordon made his reply to the toast he and we had to endure him singing the Besir song, to be fare he was much better than many a poor Besir who has had to sing this ditty in public. Collector John Brown was asked if there was any entertainment organised for the evening and fortunately there was. The first turn was Ian A Macpherson who entertained the everyone with a selection of old and well known songs. Ian does not just sing the songs, he also tells the story behind each song and a wee bit of its history to put it into context. The Deacon then toasted Gordon Weetch who had stood in for the Collector when she was unwell and also John Brown the present Collector who had taken up the post to ensure that the Merry Masons were up to strength and had a carried out his duties with great diligence. Next came more entertainment in the form of Allan McLennan who told the story of Michael who seemed to be given preferential treatment over the younger son. It turned out that Michael was a greyhound. Immediately following Allan was Collector John Brown who recited a very witty poem about Bricklayers at the bottom of his garden. This was most apposite as John is also a Bricklayer to trade. 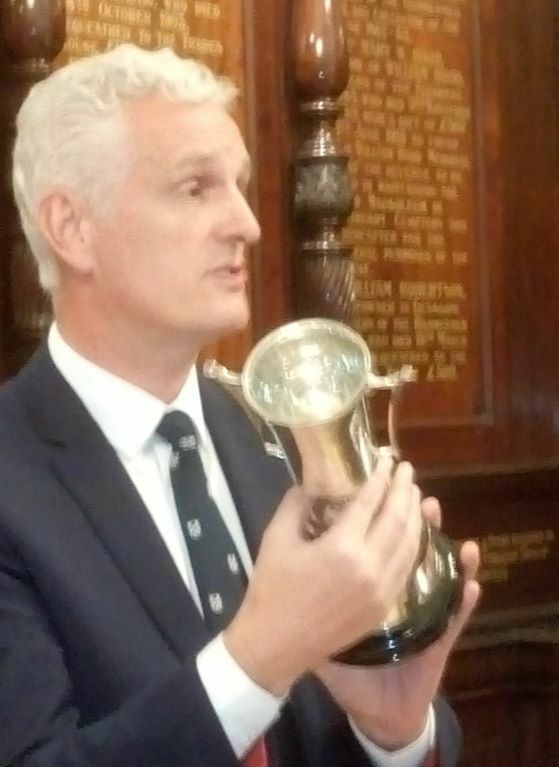 Past Deacon Graham Kelly showed the people present the McLaren silver cup won by the Incorporation of Masons' Lady Golfers. 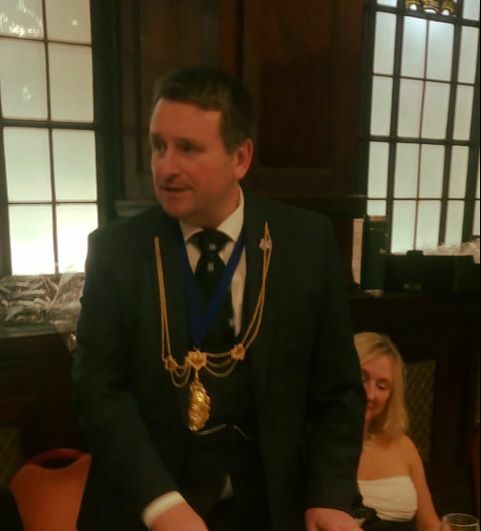 The Deacon then toasted the New Laid Stanes and highlighted that new members was the life blood of the Incorporations and how he was delighted with the new members of the Master Court. Unfortunately only James Davidson was present and he responded in a modest and humerous way. The next phase of entertainment harked back to Past Deacon Bill Richardson who was famous for his rendition of "Rule Britannia". 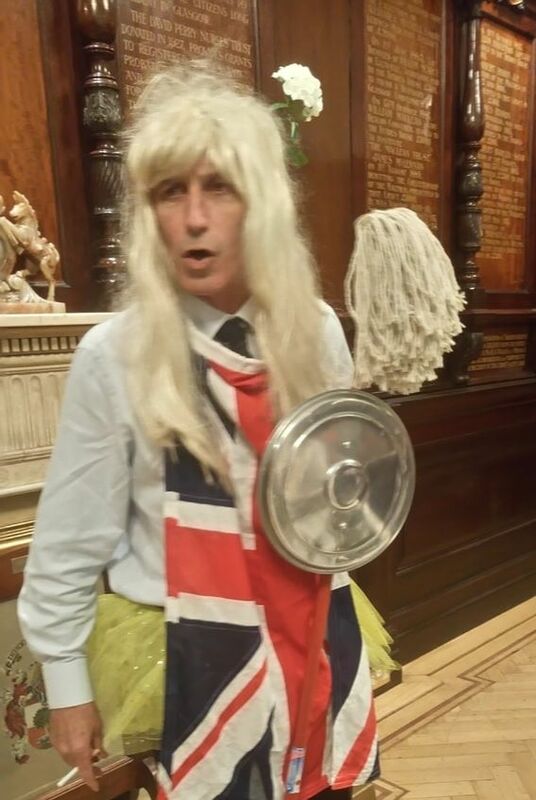 This year it was Iain Smith who carried the song with great aplomb but with humour and the most interesting attire. Some of those present who knew Ian well, did not recognise him in his designer clothing. For the sake of Health and Safety people and those against smoking, Iain's cigarette was not a real one and it was not lit. The gusto with which the audience participated in joining in the chorus was a pleasure to hear. Next came the explanation of the Pear Eating and this was carried out by Ian A Macpherson the most senior Deacon present. For those who have not been to a Merry Mason's Pear Eating evening, you will have to come along to learn about it's origins. 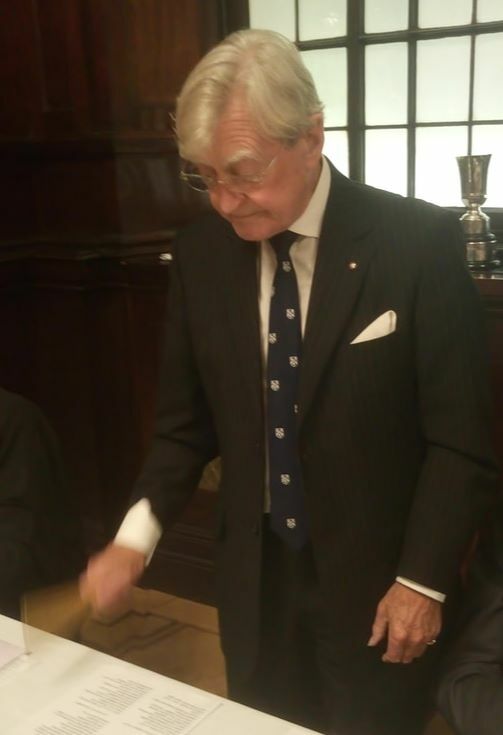 Tom Monteith, the Clerk to the Incorporation of Masons was toasted next by Deacon David McLaren. 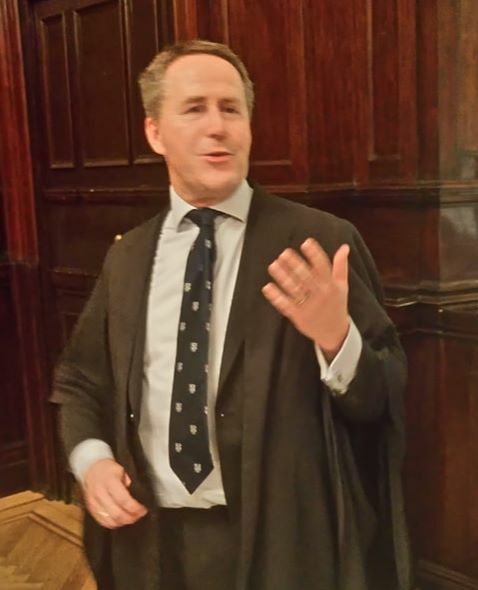 Everyone agrees that Tom has done a marvellous job in guiding and supporting the Deacon and the Master Court over the years. Tom loves this toast as he claims that it is one of the few times that a lawyer gets a round of applause. 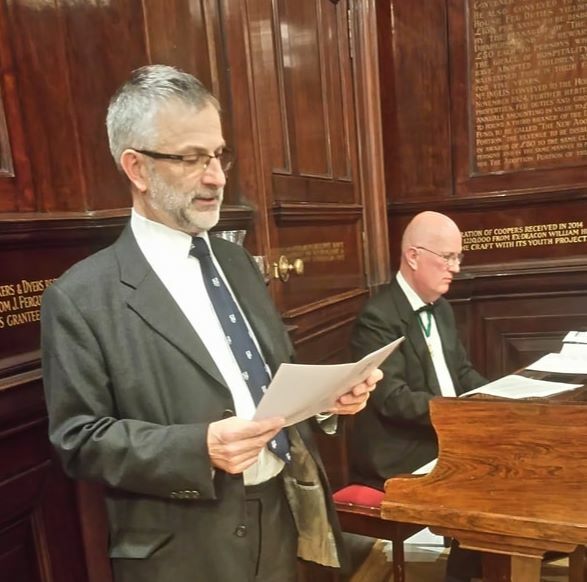 Following the toast by Deacon David, Tom gave a wonderfully humorous reply before reciting a rhyming couplet which he claims is not a poem but doggerel, no matter what it covered the work carried out by Deacon David and his Queen over the past year and was appreciated by all. At the end of all meetings chaired by the Deacon, a toast is said to him congratulating him on his chairing of the event. Late Deacon Gary Smith had the honour of toasting Deacon David and commenting on his previous year and the great success that he had achieved in his time as Deacon. Ian A Macpherson led communal singing as the last part of the evenings' entertainment. All the golden oldies were sung such as "Shine on Harvest Moon", "On Moonlight Bay" and "Bye Bye Blackbird" before the finale of "For me and my Gal" everyone joined in the singing of these great old songs. Past Deacon Ian A Macpherson Rapping the Shed. The end of the evening is always closed by the Rapping of the Shed and this is carried out by the most senior Deacon Present. 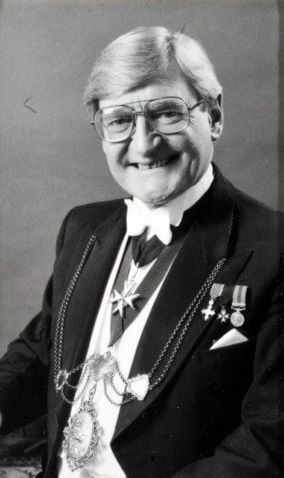 Ian A Macpherson had the pleasure and honour of carrying out the "Command of the Deacon and in accordance with ancient tradition" by rapping the shed. This custom goes back to the time when the workmen were signalled that the days work was over by the foreman rapping on the shed with a rule, metal tool or even a piece of masonry. The rapping was three slow raps followed by seven rapid raps then three short raps. The words attached to this were "Stop Stop Stop All the Masons in the shed Stop Stop Stop". 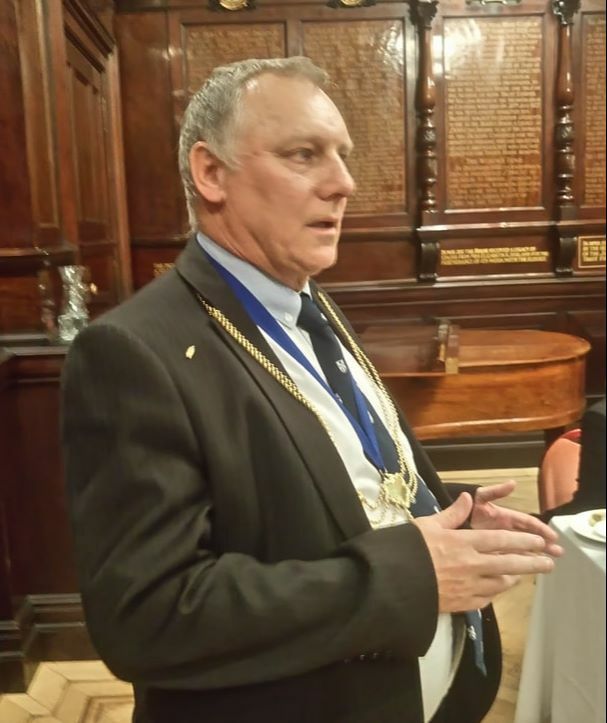 Many of those present came from quite some distance to join in the celebration of the Pear Eating, we were delighted to have Andrew Bowles, the Master of the Worshipful Company of Masons of London present along with his wife Claire. Below is a series of photographs from this great evening.